Mr. Soli Sorabjee, Mr. Nihal Singh, Mrs Rami Chhabra, Anand and Shyam Bhatia, the awardees Manini Chatterji and K.Rajendran, the many distinguished attendees present – amongst whom are legends, people who have inspired me, and friends that I have interacted with – it is a great privilege to be here speaking at the 22nd annual edition of this enormously prestigious event. 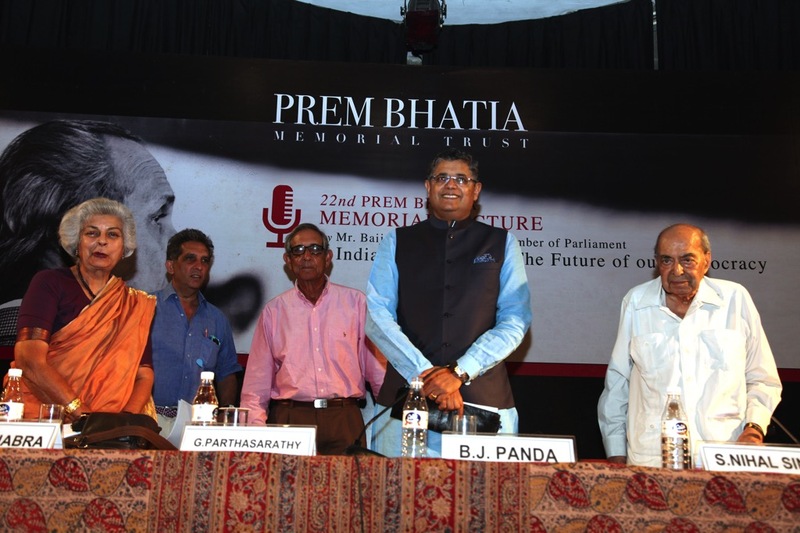 The late Mr. Bhatia has left behind standards that we are direly in need of today. Thank you for that kind and somewhat embarrassing introduction. I am sometimes asked how a politician can be into bungee jumping, and my answer is how can you be in politics if you don’t know how to jump off without knowing where you will end up. I am reminded of a quote from the late Pulitzer Prize winning author and editor, Carl Sandberg, who said that all politicians should have three hats, one hat to throw into the ring, one hat to talk through and one hat to pull rabbits out of if elected. As you can see, I am not wearing a hat. I was asked to be provocative and I shall try to do that. Not gratuitously, not just to rile you up but about issues that I have spent a lot of time reading and thinking about, and writing about. And that is the topic of today’s talk, India at Crossroads, the future of our democracy. Now this is a potentially vast subject. It could cover a large number of relevant issues, some of which were covered by Ms Chhabra in her opening comments, such as the state of the media, freedom of speech, liberalism, and that would be legitimate. But in order to make this concise and keep it within forty or so minutes, I have chosen five topics on which – as I have just said – I have read and written extensively, and given a lot of thought to during my 17 years in Parliament. I see myself as an outsider.I was not born into a political family. Circumstances led me to being a part of the founding of a new party, and now it has been four terms. Instead of talking about aspects of where our democracy is today which I consider are symptoms, I want to go to what I believe are the underlying structural issues of institutions, of rules, of checks and balances and not personalities. Too often, our discourse, our debate becomes about personalities. He is a good guy, he is a bad guy. For our democracy to make the transition that we are undergoing in a manner that will result in India being a better country by the time such lectures are delivered a decade or two or three later, we have to go to the underlying structures. I am going to be provocative. I am going to say things such as, let us remove the cap on election expenses. It is not something I say lightly. And as I said earlier, it is not something I say just to rile you up. It is something I have thought about. And I will make a case for it. I am going to say other provocative things. I wish you to indulge me in this spirit by not considering me as somebody who just wants to wreck the system but somebody who has been thinking about it. You may not agree with my prescriptions and that is okay, I would be gratified if people of your eminence would simply consider me as having taken an honest crack at what I think could be the solutions. I am going to touch on five areas. I am going to talk about judicial reform. I will talk about electoral reform. I will talk about parliamentary reform. I will talk about Aadhar and privacy. And I will talk about checks and balances. Now each of these could be a topic by itself worthy of a forty-five-minute lecture but as I said, there are many more like this, so on each of these issues I will talk about some of the core principles that I have been writing about. I will not have the time here to go into full details of all of them but should you be intrigued or interested in any of the comments I make, all of them are available online. You can google search them, you can look at my op-eds in both daily newspapers as well as long form writing in some magazines. I have expanded on each of them in different contexts. I know there are many eminent people here who know much more about these subjects than I do and as I said earlier, please do indulge me as somebody who is in the thick of politics, somebody who still considers himself an outsider, yet wishes to push the envelope and look for solutions. Judicial reform, no society, let me back up a little bit, there is something I forgot to mention which I should do right away. One of the points I keep making is that we often see ourselves in isolation. We see India where we are today in isolation. And we shouldn’t. If we look at history and we look at the histories of other democracies, there can be eerie similarities between what we are going through and what others have already gone through. I have often written about, and made a comparison to, what happened in the United States, the second largest democracy in the world after us, between the time it was about our age as a republic, 70 odd years old and the time that it became about 120 years old. That is, late 19th century to early 20th century. The similarities are eerie and amazing. Sharp growth in the economy. Sharp transition from rural to urban populations. Transition from agriculture to industrial economy. Sharp rise in corruption. This was all called the Gilded Age in the late 19th century and in the early 20th century it was followed by what was called the progressive era which brought about some of the political reforms that I have often advocated for our country. We don’t need to emulate any other country blindly. But I think it is worthwhile for us to recognise that we are not unique in charting a large democratic future. We should cherish our democracy. It is now celebrated around the world. But we live in it. We see it, warts and all. We see the cracks inside and it is for us to deal with them and to plan for the next 70 years or 50 or 20. There are many that would wish that we weren’t a democracy. I meet many people who envy countries like China for instance which had a similar per capita income to us as recently as 1980. In a little more than three and a half decades, they have reached a level of an economy five and a half times larger than us, have done a much better job of eradicating poverty and now have unparalleled clout in the world. We haven’t done too badly in the last three and half decades and we have done it democratically. The transition, the choices that we face today, I believe and I have sometimes described it as a transition from being argumentative Indians to being decisive Indians. Being decisive doesn’t mean giving up on democracy but it does mean addressing some of the issues which cause us to spend decades in deciding who we ought to be, where we ought to be heading. So to come back to the five areas that I wanted to touch upon. Judicial reform. No society can do well if justice is uncertain or delayed, and every one of you here will agree that we have a backlog, we have a clogged judicial system where even heinous crimes can sometimes take decades to go through the processes of investigation, prosecution and trial not to mention appeals. This needs to be fixed. I won’t have time to talk about all the aspects that I have thought about but one aspect that I do wish to talk about is the appointment of judges. Now two years ago our Parliament unanimously passed, unanimously, with all parties together, the National Judicial Appointments Commission. I believe it was a wonderful piece of legislation. It was modelled on the UK’s Judicial Appointments Commission and I will explain why I thought it was very good. We have the world’s only self-appointing higher judiciary. No other civilised country has this. I believe it was necessary then in the 1970s and ‘80s for the judiciary to take upon itself the appointment of other judges because of the risk to democracy that existed at that time following the three judges case and the overstepping in judicial matters by the executive. I believe that the time for that has passed. There are judges who are beginning to criticise the collegium system. It is not transparent. A democracy does not deserve a judiciary where the appointments are not transparent. There have been allegations of fostering of nepotism. Now other democracies appoint judges with systems of checks and balances. The grounds on which the higher judiciary, the Supreme Court struck this down, and I humbly disagree with those grounds, were to protect the basic structure, to protect the appointment of judges, from interfering politicians. But very few people paid attention to what the appointment system was. In the UK, the judges had hardly any say in the new Appointments Commission. Most democracies in the world have some involvement of the executive. For example, in the US, the President nominates, there is some involvement of the legislature, again in the US the Senate decides. In other countries, they have slightly different systems. What our system had – and this was not understood; I urge people to spend time on this because this is a topic that will return and ought to be supported –the National Judicial Appointments Commission. This Commission (if it does make a reappearance) was to have a committee of three judges, the Chief Justice and the two senior most judges; one member from the executive, the government, plus two government nominees, so-called eminent public intellectuals, so let’s assume them to be more or less part of the executive because the government would nominate only those people with whom it feels comfortable. So three from the executive, three from the judiciary but guess what, also one member from the opposition. So if the government member with the support of the two eminent government nominees, wanted to foist somebody who was not appropriate, it could be blocked by the three members of the judiciary if they were united or had the support of an opposition member. Checks and balances, I will come back to a little bit later. Electoral reform. We must be proud of running the largest elections in the world. Hundreds of millions of qualified voters. When I was growing up in the 70s, I used to read international journals and newspapers and magazines and they all used to express apprehension as to whether any of India’s current elections would be the last one. They weren’t. India is a democracy, although in my opinion not a full democracy in the sense that historian Ram Guha says: Democracy is not only about elections. It is also about democracy between elections. And we have flaws in our system. Everybody knows that the expense caps on election campaigns are routinely violated. Everybody knows that. I think it was based on the noble idea that elections shouldn’t be bought off by people with lot of resources, that there should be a level playing field. Yes, I agree with that idea. But this isn’t solving the problem. What this has done is to allow enormous amounts of money to be spent under the carpet. Enormous amounts of illegitimate funds are brought into politics, all under the carpet. We should be looking for ways of emphasising transparency and the legitimacy of the money. And that is harder with the system that we have, we have tried, we have tried for many decades and it still doesn’t work. Let me explain something. Let me compare with other democracies. You know Donald Trump just won the US presidency last year and he was the first billionaire to have won the US election. Do you think that is why he won it? Statistics show that he spent less than half of the Clinton campaign’s budget. He didn’t win it because he had money. He won it because of his strategy. You could disagree with what he says but that is what won him the election, not the money. Go back one or two elections before that. You had Barack Obama who managed to raise much more money than the established contenders, the Clintons, who at that time had been in power for a long, long time, and later Senator McCain. These were establishment figures, Obama was the outsider. And yet he outspent them hugely because he raised a lot of money from individual small donors. What we need to do is provide a system that enforces transparency and doesn’t focus on limits. How do you do that? I believe that one of the requirements is to provide state funding which helps the non-rich candidates. Today we are not helping the non-rich candidates. Today all the candidates are spending enormous amounts of money but it is under the carpet. The way to help non-rich candidates is to do what some other democracies have done, to provide matching funds. There are people in this audience who I think would make wonderful public representatives. They would be hard put to compete against an established political candidate but I believe some of you have reputations such that if you decided to launch a campaign to raise money, people would give you money, particularly if you leverage it with technology and put it up on Facebook and have big campaigns. What we ought to do is give matching funds to people with traceable donations, cheque payments and extra matching funds to small donations. New York has a system where if you raise small amounts of money, I think it is about $10, state funding gives you disproportionately higher matching funds. You get $50 for every $10 that you raise through legitimate traceable sources. If you do that, you are helping the little guy to compete against the well-heeled, deep pocketed candidate. You provide a level playing field because you are enforcing traceability of the money. That is crucial. If there is traceability of the money, then it is not likely to be coming from drug dealers or terrorists or illegitimate businesses. Traceability and a leg up for those who are able to get legitimate funds, and especially those who get small legitimate funds. You could put a cap of Rs 1000 or Rs 5000 per donation and give disproportionately higher money. Other countries have done this with some success. It is radical, I know, but what we have is not working. Just trying to do more of the same, as some people advocate, is not going to work any better. We have tried it for many decades. Let me move on to parliamentary reform. Again, this is a subject I have written and spoken a lot about. What struck me as I got to understand the system from the inside is although we are a real democracy and we have real elections, how that is being undermined by some of the rules that we have inherited from the colonial era. Now we had a proto-parliament about three decades before Independence. And the Raj did that to yield ground to the nationalist movement. And it provided our founding fathers and mothers a platform for raising national concerns, even participating in government. But the real power remained with the Viceroy. And some of those rules continue, most of those rules continue till today. I will give you one example that shocked me when I first came in, and still shocks me. Most people, I guess, don’t think about it too much, because when I mention this to college students or to others, they say, this can’t be! But it is. We are the only democracy in the world where, after a Bill is passed by both Houses, then goes to the Head of State and gets signed, and becomes an Act, the government is not bound to act on it. Sits on it. In many cases, doesn’t get implemented within a timebound timeframe. There was a terrible case a few years ago about sexual harassment in the workplace. When the law had been passed, had become an Act, but was not notified. It was a horrific case. The law couldn’t be applied because it wasn’t notified. I think it happened about six years ago. I have a Private Members Bill proposing a timeframe for notification of Acts once they are signed by the President. We don’t have rules by which Parliament is to function. Don’t blame the personalities, the personalities are incentivised by the system to act in a certain way or not. Now we have a thick rule book. We have many different kinds of apparent rules that make Parliament function, but you know what we actually have is almost every rule except one, except the no-confidence motion which requires the signature of 50 MPs and then it must be implemented. I mean that you are obliged to put it to vote if 50 MPs sign it. Every other rule comes down to a form of requiring three MPs to sign demanding it, but the Speaker has to decide it in consultation with the Business Advisory Committee which in essence becomes a veto because it is consensus based, there are 36 parties in Parliament, everyone has a veto. So you can have a regional party that doesn’t want to discuss an issue that embarrasses it. You could have a national party that doesn’t want to discuss an issue because it is embarrassed. You can have the government that doesn’t want to discuss an issue. Why should the government agree to discuss inflation if inflation is bad? Other democracies have moved on to number-based and other similar rules. Let me use a simple example. it is like in Delhi when some of you were younger, turning the clock back a few decades, you probably didn’t need traffic lights. There were very few cars around. If you had two cars come from opposite directions at a crossroad, they would figure out who should go first with a degree of courtesy. Can you imagine Delhi today without traffic lights? Actually even with traffic lights it doesn’t work very well today but I think you get my point. When you have 36 parties, you cannot decide on consensus, and every single day we have this rigmarole: What is to be discussed? Should it be a voting discussion or a non-voting discussion? Often the government will not agree to a discussion on something that embarrasses it. After two weeks of disruptions, it will say, okay, we will discuss it but it shouldn’t be a voting discussion – because it will embarrass it further. In the UK if 40 Members of Parliament sign on a discussion demand, it gets discussed. They also have certain days of the week that are fixed for opposition to set the agenda. So government can’t prevent that. We need these rules, specific rules, to decide the agenda, not some 19th century understanding of Victorian courtesy and consensus. I have proposed we should have 50 Members of Parliament to sign for any discussion and it must happen, no Speaker’s discretion, no consensus among the Business Advisory Committee. It proceeds on an increasing scale: 100 Members to sign for it to be a voting discussion and 150 Members to sign for a no-confidence motion. Today it is 50 members for a no-confidence motion but why make it frivolous? You need 272 to make a no-confidence motion work. If you can’t get 150 people to sign, why bother? Make that more important. Have 50 and 100 signatures based for voting and non-voting discussions. No discretion. Parliaments elsewhere have moved on. I created a lot of controversy two years ago in proposing a discussion about Rajya Sabha reform. Let me reignite that controversy here. Our Rajya Sabha is based on 19th century ideas, a mix between the House of Lords and the US Senate. It is indirectly elected. It has the power to block all non-money bills as long as it wishes. That used to be the case with the House of Lords. And the US Senate in the late 19th century used to be elected from state assemblies like ours, our Rajya Sabha is. They both changed in the 20th century. The UK House of Lords can now block a Commons bill for only a year. With revisions in 1911 and 1949, they first reduced it from a permanent veto to a two-year veto to one-year veto. That is the right thing because an Upper House that is indirectly elected like ours should act as a caution against the Lower House, the house of the people, getting carried away in a rush of madness to do something that is populist and against the long-term interest of the country. But if the Upper House which is indirectly elected has a permanent veto, that is not really democracy. That acts against the will of the people. So to amend it like the Lords was amended, namely to use the veto as a break, to act as a caution, so that the Lower House – if it wants to railroad something – gets slowed down by a year, which gives the country an opportunity to think about it more. And then if it still wants to pass it, the will of the people ought to prevail. The US took a different approach. In 1913 in the 17th amendment to their Constitution, they made their senate directly elected. That is an alternative that we could consider. If you make the Rajya Sabha directly elected, they would represent the entirety of a state, not just be nominated by a party leadership. That would make them much less provincial. That would make them appeal to the broadest section of a state in order to get elected. I could go on but let me move on to privacy and data protection and I will end with checks and balances. If you will bear with me for another ten minutes or so. There has been a lot of debate about Aadhar, the universal identification system with biometrics, and the risk to privacy, and the reason for protecting privacy. The Supreme Court is hearing a case on whether privacy is a fundamental right or not, derived from (please correct me, there are so many eminences here) as I understand it, Articles 19 and 21 giving the Right to Life which has been held by the courts as incomplete without dignity. I believe privacy ought to be a fundamental right but I am not against Aadhar. Now the narrative has been captured, Aadhar has captured the imagination in both positive and negative ways because it is the world’s largest biometric programme, more than a billion people already registered but the argument goes far beyond Aadhar. For 20 years we have had increasing electronic transactions, credit cards, all kinds of payments through apps which are equally deserving of privacy and data protection. By the way, I have a bill in the Lok Sabha, a Private Members bill on privacy and data protection as well. Now when we argue about the risk Aadhar brings to privacy and data protection, we should also talk about credit cards, we should also talk about other kinds of transactions. In the modern 21st century, we can’t do without some of these technologies. It is impractical to think that we can do without digital transactions. And I see on the ground, the very real benefits that Aadhar brings. I conduct reviews every quarter and I ask the Collector to do audits in schools. Every time they do a physical audit, they find 15-20% fake students. Non-existent students enrolled. Why? Because they issue mid-day meals in the name of these ghost students. They issue uniforms. They issue all kinds of benefits, text books. Where do you think that goes? There is huge leakage, there is huge corruption out there. Studies on many of the government programmes, and we have several hundred of them, show that between 40-73% of the expenditure doesn’t reach the beneficiary. Aadhar does provide a very real benefit in de-duplicating and removing corruption and leakage from the system. But that doesn’t mean that it can be given a free hand. We must have a privacy and data protection law, I believe it is a fundamental right but I believe that it can’t be absolute. No right can be absolute. And I believe that exceptions to it must be extremely narrowly defined. I want to end this part by citing you one such exception. Again, I have studied the norms in other countries. The exception I want to cite is national security. Post 9/11, some of the other democracies, developed countries, have grappled with this problem a lot. One of the issues, let’s say, is whether a national security requirement should exist for surveillance, for mass surveillance, for profiling. That goes against democratic values. But you have real threats out there. You have real terrorists out there. How do you deal with that? So here is one idea for you. Today it is possible to monitor what is called meta data without compromising an individual’s privacy. So there are powerful computers which can monitor this. We have a billion cell phones today sending billions of SMS messages and billions of email messages. Now you can have, as other countries do, monitoring of the meta data of all these communications, SMSes and emails without violating any individual’s privacy. It is just monitoring the entire bulk of messages, the cloud of messages, nobody’s privacy is given out and you could have an algorithm to look for the word RDX. As you know, that is a very commonly used explosive, very often used by terrorists. Now there is nothing wrong in somebody being curious about RDX. I myself have googled RDX to find out more about it. But if from a particular address or a particular IP address you find the use of the word RDX inordinately highly, for example, in a week that word crops up ten thousand times on one phone or thousand times in one email, there might be reason to wonder what is going on. Even then no authority should have the ability to go in and invade somebody’s privacy, but if such analysis of meta data without compromising individual privacy yields clues, or what I would call prima facie evidence of something suspicious, then with proper checks and balances and with a magistrate’s authorisation, I think the authorities should be allowed to look at that particular cell phone or that particular address a little bit more closely. That would indeed violate privacy. But these exceptions have to be extremely narrowly defined. Otherwise we compromise the basic dignity of our life which compromises our right to life. Again I could go on with many other examples but since there is limited time, I will come to the very last point: checks and balances. Everything I have talked about today is about checks and balances. What does this mean? We already are the world’s largest democracy, we already conduct the world’s largest elections. I have pointed out some of the issues that we need to resolve so that we are as just as much admired around the world between elections as we are admired for our elections. And it is not only the world’s admiration that I am seeking. It is a legacy for the next generation of Indians that we ought to commit to leave. So my idea of checks and balances is that we can’t have a government that is so bogged down with checks that it can’t function. Neither can we have a government that has so few checks that it functions wantonly. And this, I submit to you, requires a couple of changes. I will end with these last two examples. From the Raj we inherited systems where the government was final. Until the three judges case it used to be the executive that appointed the judges, there was no involvement of the legislature or anybody else. The executive used to appoint other appointees. Still does. Still appoints the election commissioners. Now we have a semi check and balance in the case of the appointment of the CVC, the Chief Vigilance Commissioner which, in my opinion, is not really check and balance. The CVC is appointed by a committee consisting of the Prime Minister, the Home Minister and the Leader of the Opposition. Is that a check and balance? No. Because if the Prime Minister and the Home Minister have decided whom they want, they can easily out-vote the Opposition Leader. I gave you an example in the beginning about the NJAC, the National Judicial Appointments Commission and how it was delicately balanced so that the government couldn’t railroad its way unless it had the support of either one member of the judiciary or one member of the opposition. And the judiciary could block it unless this confluence of forces came together. So for a similar important authority, the CAG or Controller and Auditor General, I have proposed the following: that the committee to appoint the CAG should consist of the Speaker, the Prime Minister and the two Opposition Leaders of each house, Rajya Sabha, Lok Sabha. So that is almost a 2/2. You may believe that the Speaker, obviously from the Prime Minister’s party, would support his candidate, but hopefully the Speaker sometimes will rise above the fray. But if you have the Prime Minister and the Speaker on the one hand and the Opposition Leaders of both Houses on the other, it is a 2/2. And if between them they have a majority to appoint a CAG, that is likely to be good. It is a situation where the government is not able to railroad its choice of a crony as a CAG, neither is the opposition fully in a position to veto because I have a fall back. If the 2/2 tie actually ends in a tie which doesn’t get resolved, I don’t know how this will hold up in the Constitution. My idea is to send it up to the Chief Justice as a tie breaker. So my efforts at thinking about checks and balances to move our rules away from colonial era Raj rules to robust 21st century rules for the largest democracy in the world lead to this kind of an approach. To give the government enough of a leeway to act, to be decisive provided it can carry or have the support of either some members of the opposition or some members of the judiciary. It should not act in solo fashion, but neither should it be in such a situation that it cannot implement its agenda because it is vetoed at every corner, at every pitstop, along the way. Thank you for indulging me in sharing with you my thoughts on where our democracy is and where I believe it ought to be headed. As I said in the beginning, I don’t expect you all to agree with me but if you allow me the credit of having thought this through and brought what I consider my impartial judgement to improving the system, I would love to have either your support or your constructive criticism in the coming days. Thank you very much. Jai Hind.